In the world of digital marketing, we as marketers are increasingly challenged to measure and report on the return on investment of virtually all of our marketing tactics. This isn’t necessarily a bad thing, provided we are measuring what matters for a particular channel and medium. But it’s difficult to tie everything directly to ‘sales’ or some other bottom-line metric. Instead of trying to ‘always be closing’ with our videos, we should instead create video content that aims to achieve smaller wins throughout the customer journey. For example, we might create video content to help generate traffic by improving a page’s ranking in search or to answer frequently asked questions on a website. We might use a different video to promote registration for a webinar or to generate leads for a sales demo, and so on. Like a football team, we need to look at the bigger picture to see how all of our players (in this case our videos and other content) are working together. This is where Google Analytics can come in. Google Analytics can be setup to provide many of the same metrics that are available in video hosting platforms, such as the number of video plays, the amount played, etc. 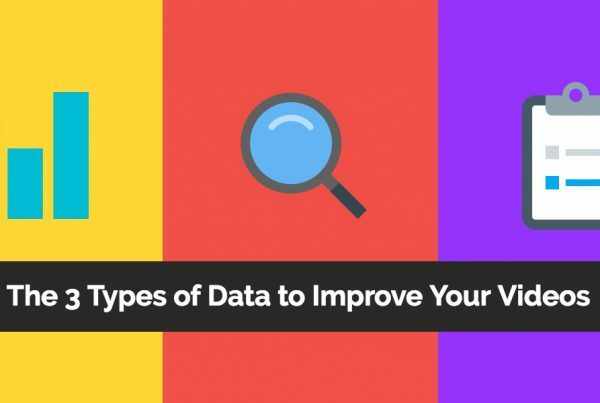 But while the analytics that you already have access to in YouTube or from dedicated video hosting platforms such as Wistia might be more useful in helping you to understand things like the retention rate of your videos, GA can provide a more comprehensive picture of how your videos are contributing to your larger marketing goals. One way to measure the way your videos are contributing to your website’s goals is by segmenting your audience by those who have watched videos compared to those who have not. Google Analytics can help you to measure the impact of the videos on your website against common metrics like page views, bounce rate, and average session duration. An example of how video viewers can be segmented for comparison to non-video viewers in Google Analytics. 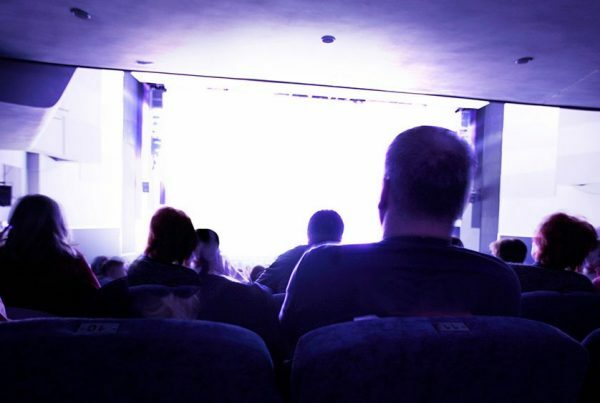 By creating a segment for ‘Video Viewers’ (those visitors to your website who watch any videos during a given session), you can use this segment in virtually any report. You can also use it as a measure to report on how your videos are impacting any goals that you’ve set up in Google Analytics such as conversions to a contact form, or even product sales and revenue reports for e-commerce websites. 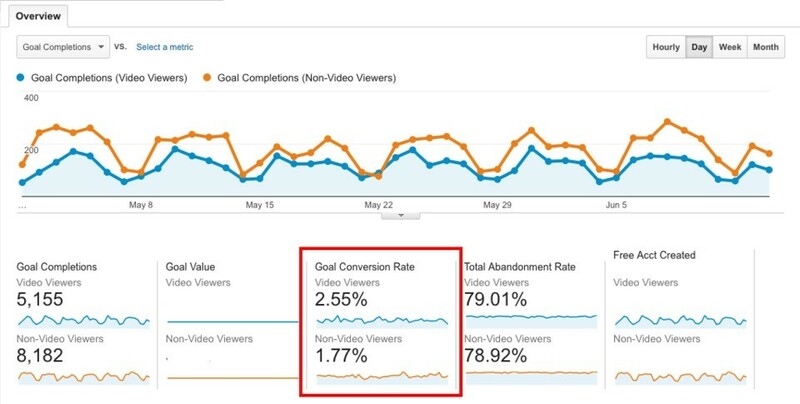 An example of how Wistia.com was able to report on how video has impacted conversion rates. In the example above from Wistia.com, they’re able to say that users who watch videos on the website are around ~70% more likely to convert than those who do not watch a video. Provided that they are able to put a monetary figure on the value of a conversion, it would then be a simple calculation to determine whether or not their investment in video content has provided a positive ROI. 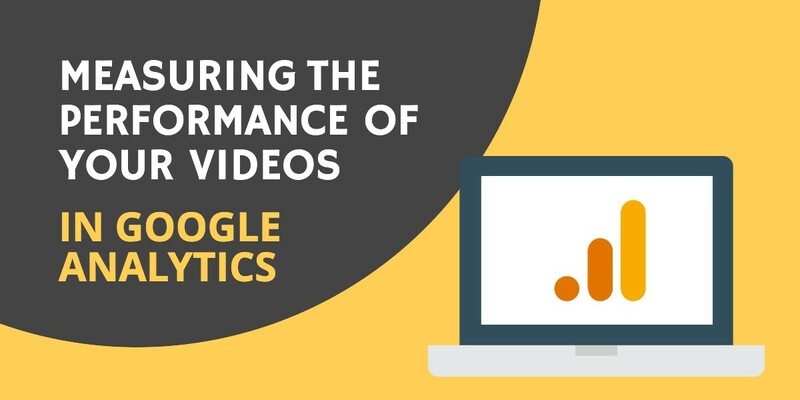 Setting up Google Analytics to measure video performance can be very simple or somewhat complicated, depending on the video hosting platform that you’re using to host your embedded videos. The two most common that we see are Wistia and YouTube, so we’ve included instructions for both below. We recommend using a professional video hosting platform like Wistia for a number of reasons, including how easy it is to integrate with Google Analytics. Once enabled, Wistia will automatically send the appropriate ‘triggers’ right to your Google Analytics account, provided that a Google Analytics tracking code has been properly set up on the pages where your videos are being hosted. Enabling the integration is as easy as clicking the Connect button, with no additional login to Google Analytics required. Events can be found within the “Behavior” section of your Google Analytics dashboard. If you decided that you want to stop tracking your videos in the future, you can turn it off for your entire account in your Account Settings (and can even disable Google Analytics for a specific video). If you’re using YouTube to host your embedded videos this, unfortunately, gets a little more complicated since YouTube doesn’t send the required ‘triggers’ to Google Analytics automatically in the same way that Wistia does. Check out this step-by-step explanation of how to track YouTube videos with Google Tag Manager and Google Analytics., all of which is summarized in the great video below. Setting up custom segments in Google Analytics will allow you to break down your web analytics performance based on users who engaged with your video content compared to those who did not. I hope both the examples and the tools included above will help you better measure the return on the investment you’re making in your video marketing. Feel free to get in touch if you’d like some help in setting this up, or to get started on your next video project.